Here's something I came across recently that struck me as rather amusing (although cryptozoologists might disagree). It comes from a book called Mathematics in Victorian Britain , and it's meant to illustrate the concept of a syllogism -- the basic form of logical argument in classical (Aristotelian) philosophy. There are three parts to a syllogism: (1) a particular premise, (2) a universal premise and (3) a conclusion. The conclusion follows logically from the two premises, and must be true if the premises are. A common example of a syllogism given in textbooks is (1) Socrates is a man, (2) All men are mortal, (3) Socrates is mortal. This comes from a book called Symbolic Logic, written by Lewis Carroll... the same Lewis Carroll who wrote Alice's Adventures in Wonderland and The Hunting of the Snark. "Lewis Carroll" was the pseudonym of Charles Dodgson (1832 - 1898), who worked as a lecturer in mathematics at Oxford University. Symbolic Logic is one of his less well-known works -- a light-hearted exposition of the subject aimed at a non-technical audience. 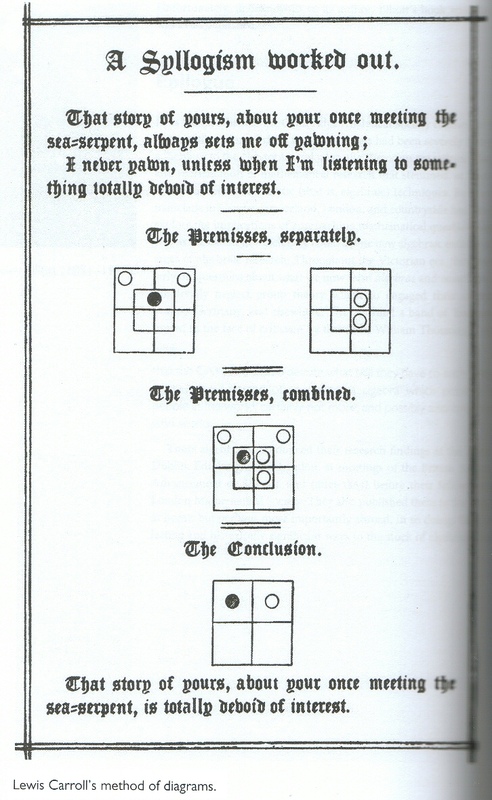 Carroll/Dodgson devised a graphical representation (which can be seen in the illustration above) involving the placing of coloured counters on a grid after the manner of a board-game. 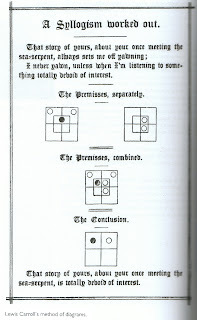 Mathematical games were very popular in Victorian Britain, but I'm not sure if Carroll's "Game of Logic" ever took off!